Hey their airplane enthusiasts, I've got a treat for you today! 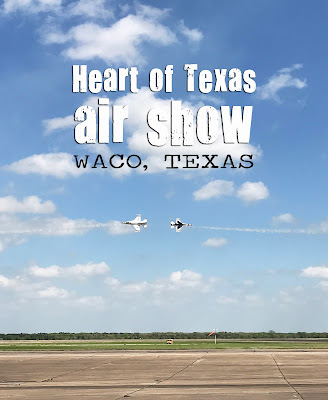 A couple of weekends ago, Lovely & I ventured out to the Heart of Texas Airshow just a few miles from our home. Though the show's planes tend to fly over our house, we just couldn't pass up the chance to be front and center. The U.S. Air Force Thunderbirds were in town for the show, and boy did that bring it! The airshow features pilots & planes from all across the U.S. They have the most incredible talent, stamina for the twirly, swirly tricks, and beautifully painted planes. A couple of the pilots were in their 80s! Talk about living life! The yearly event is perfect for the whole family, though a little pricey. If you plan on trying to catch 2018's show, I recommend buying tickets in advance on the HOT Airshow Website for a bit of a discount. But you definitely catch an amazing show, and fun for the whole family with vendors, food, military planes you can tour, and much more. The two of us had a blast, and look forward to heading back next year.